If you fancy hot chocolate but can’t bear the thought of steaming mugs of that delectable beverage in the heat of summer, here’s your ultimate how-to guide to making iced hot chocolate. 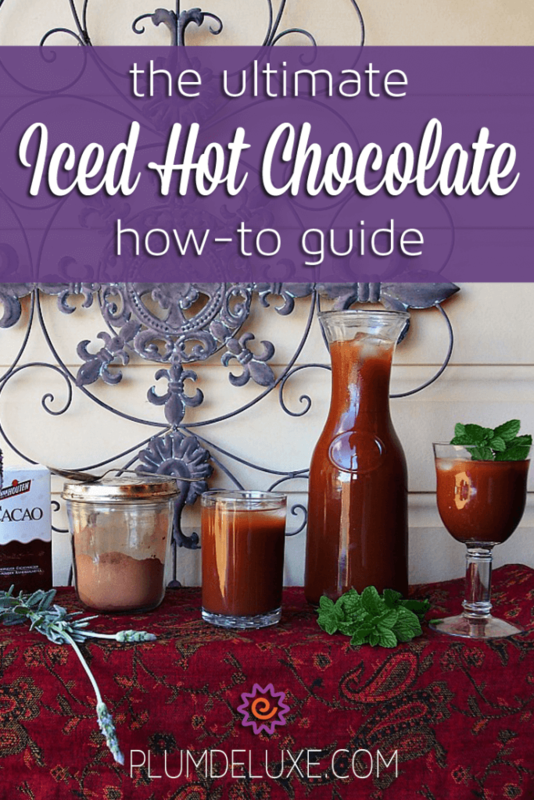 Iced Hot Chocolate is simply hot chocolate that is either poured directly over ice or has been chilled until it’s nearly ice cold, then poured over ice. I prefer chilling mine first since I find the hot chocolate melts the ice quickly and I end up with a watery drink instead of the rich, chocolatey one I love. Iced hot chocolate must be made hot and then chilled, otherwise the cocoa and sweetener do not melt properly and you end up with a cold, clumpy mess. Shudder. A decadent cup of iced hot chocolate begins with the very finest cocoa. 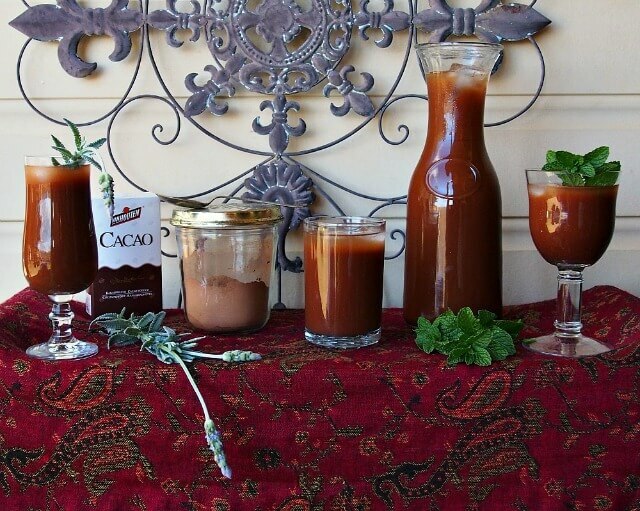 If possible, choose a raw cocoa that has a high natural cocoa fat content, since this ensures a creamy, smooth hot chocolate with an intoxicating aroma and deep chocolate flavor. Here at Plum Deluxe we love our “Comfort Cocoa” Hot Chocolate Mix made in-house. Once you choose your cocoa, simply prepare your hot chocolate as you normally would. I like my hot chocolate dark and strong, with just a hint of sweetness, so I make it with hot water, no milk, and sweeten it with real maple syrup which allows the cocoa flavor to shine. If you prefer your hot chocolate creamy, add a drizzle of good whole milk, a spoonful of powdered milk, or, if you’re feeling especially decadent, a teaspoon of sweetened condensed milk. At this point you can personalize your hot chocolate with a myriad of flavorings. Try fragrant lavender hot chocolate or cool mint. Stir in vanilla extract, or experiment with other extracts such as almond, hazelnut, orange, or strawberry. To make your iced hot chocolate a bit more grown up, add a drizzle of coffee liqueur, a spoonful of Baileys, or a fruity liqueur like black raspberry or sweet cherry. Spice it up with a sprinkling of cardamom, nutmeg, or a light dusting of cinnamon. Once your hot chocolate is just the way you like it, pop it in the fridge for an hour to chill thoroughly. I like to make a big batch, mixing my hot chocolate in a large jug then transferring it to an empty bottle that I can store in the fridge for a few days. Just be sure to give it a good shake before serving since the cocoa tends to settle at the bottom after sitting awhile. 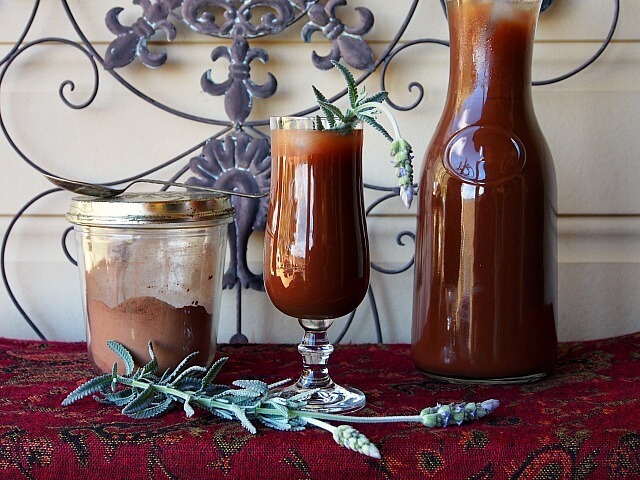 Once the chocolate is chilled through, serve it in a large glass over ice, and add a sprig of fresh mint or lavender. If you really want to go all out, add a scoop of vanilla ice cream to the glass, then pour over the chilled chocolate. Or top it with a dollop of lightly sweetened whipped cream and a dusting of cinnamon before serving.